Formed in 2002 Kingsley Construction (Southern) Limited is a family run business which prides itself on quality workmanship and a high customer focus. We are able to provide a complete service from design through to completion and have a reliable, trustworthy team of professional trades people. We are fully insured and are members of Constructiononline which provides you with peace of mind when using our services. 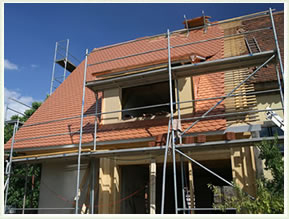 We have developed long and rewarding relationships with many clients, both commercial and private. These include Slough Borough Council, RBWM, Chiltern District Council, Wycombe Council, Housing Solutions, One Housing, London & Quadrant Housing, Claires Court Schools, Sapcotes and many more, including private clients.